The North Central should be potent again in 2017. Carleton senior Jake Ritmire. Photo: Brian Whittier. This article was written by Mizzou’s Colin O’Brien. COLUMBIA, Mo. — #6 Carleton and #5 Wisconsin, two North Central rivals, squared off in the finals of MLC for the second straight year. Unlike 2015, when the Hodags finished off an undefeated weekend with a 12-9 victory, this time it was CUT who emerged victorious in a 10-9, cap-shortened affair. Wisconsin finished second in Pool B after notching wins against BYU, Arkansas, Notre Dame and Iowa State. Their lone loss came to Colorado, 13-11, in the final round of the day. Carleton also finished Saturday with one loss, taking out Texas and Missouri with ease, and beat Minnesota 13-11 in the day’s second round. CUT’s loss came to a surprising Texas A&M squad 11-10, a team that finished undefeated in pool play and is looking as strong as ever after Dalton Smith’s departure. On Sunday, Wisconsin went through Indiana and Cincinnati before running into A&M and dispatching Dozen 12-10. Carleton’s Sunday schedule saw them take on Air Force, Purdue and Colorado, and culminated with the CUT squad advancing after a 12-10 win over Mamabird. In the final, Wisconsin started on offense and rung up two fairly easy holds on Graeme Kernick assists. Carleton, wearing avocado green shirts with the CUT logo emblazoned on the upper left, was the first team to flinch, allowing a Hodag break after a miscommunication on a swing pass. Two quick break throws, an around, and then a smooth inside backhand got Wisconsin off the force sideline and set Ian Hahn up to throw a flick blade over the head of a Carleton defender to make it 3-1. CUT answered two points later, however, after the two teams traded turnovers. Elliot Mawby earned a handblock immediately after Wisconsin checked the disc in and Sol Yanuck looped a backhand break to even the game at three. The teams traded holds to 4-4 until Carleton freshman Joe White decided to make his presence felt. A midfield Wisconsin look to the end zone floated out of bounds, but the Hodags pressured CUT into a high-stall punt that White came down with. Nobody could agree whether or not he had come down with the disc inbounds though, so it was sent back. Carleton worked the disc to midfield and White took off deep, converting the break with a huge sky over two Wisconsin defenders. The Hodags’ next possession took them to within five yards of the goal line but a miscommunication gave Carleton the disc back and a late switch call allowed White to catch an uncontested deep shot from Yanuck. He dished to Ethan Bloodworth for the second consecutive break and a 6-4 lead that would prove insurmountable. The teams traded into halftime and Wisconsin was able to break the Carleton O-line out of the break, but got no closer than 7-6. The game effectively ended after a marathon eight-minute point brought the game into hardcap with Carleton holding a 10-8 lead, but Wisconsin scored for pride to really end the game. Carleton’s pulls were fantastic all weekend. Whoever was pulling (usually Eric Taylor) consistently gave his teammates the hangtime to prevent much in the way of upfield looks and rarely sent one out of bounds or short of the endzone, regardless of which direction CUT was defending. 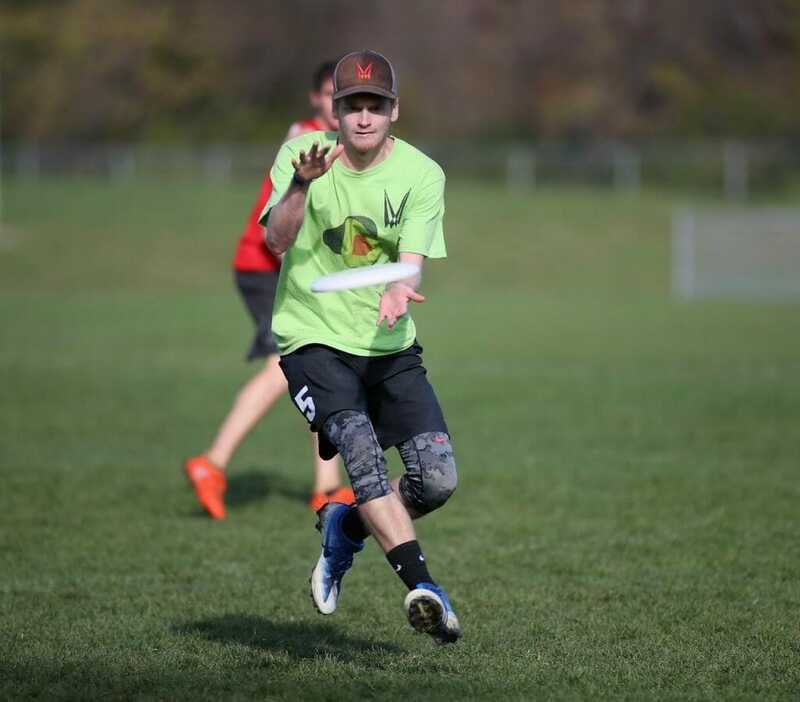 CUT’s defense was happy to let its opponents swing the disc, frequently sending off-handler defenders to poach the force side handler space and trusting their downfield defenders to prevent yardage gain. This worked for Carleton because their handler defenders were very good at reading throwers’ body language, and usually recovered and set the correct force by the time the throw arrived to the poached handler. Wisconsin looks as good as they ever have, and deserved to be playing in their third consecutive MLC finals. The Hodags were likely kicking themselves a bit after their early mistakes in the final prevented them from making up that ground, but overall the team played very well in Columbia. Their offense looks potent and, once they iron out the self-defeating miscues that brought their championship run just short, it will take them far in the spring. Comments on "Carleton Tops Wisconsin To Claim MLC Men’s Title"